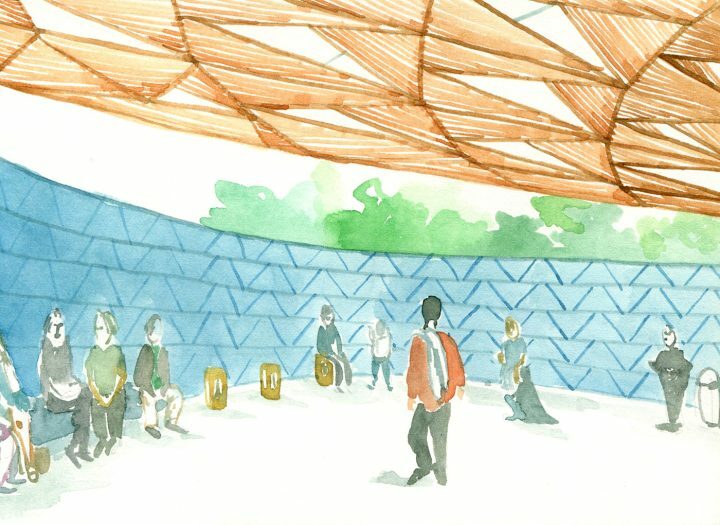 Spaces for rest, reflection, and community at London’s Serpentine Pavilion. 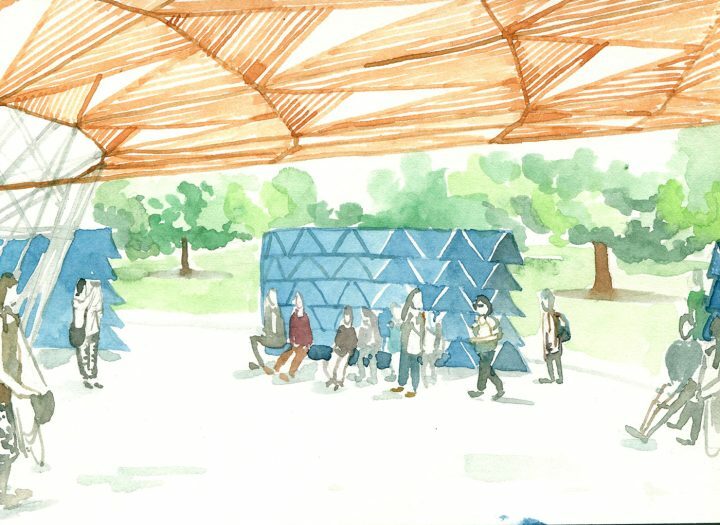 While on vacation recently in London, I made a trip to the Serpentine Pavilion, the Serpentine Gallery’s annual architecture commission, designed this year by Francis Kéré. It is a typically British cloudy day, threatening rain, but atypically cold for this time of year. The greenery of Kensington Gardens seems muted, dull, beneath the overcast skies. I approach the pavilion from behind, around the Gallery, the bright blue walls appear as a beacon of color and lively activity. There are three paved paths in the park leading to the building. The building’s curving blue walls gently sweep in or curl outwards, creating openings that scoop you inside. The walls are set within a large circle of concrete flooring, mirrored above in the outline of the roof canopy made of wooden slats, inspired by a great tree in Kéré’s home town of Gando, Burkina Faso. In this transitional space — beneath the roof canopy, but not inside the walls — children play on a beautifully milled wood slide, and people ambulate around the pavilion, or sit on the benches facing out. The wood is worked to beautiful results. 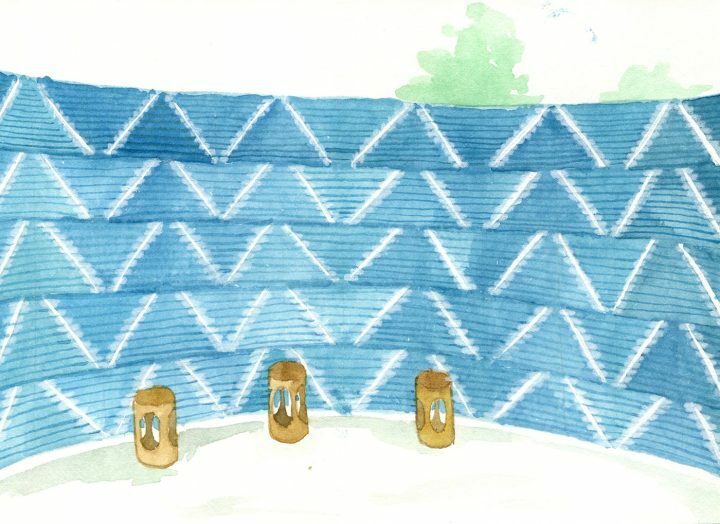 I stop to admire the subtly chamfered cuts on the blue-stained wood blocks, which create a triangulated pattern of light and shadow that recalls traditional western-African textiles. Arriving inside the space is like a surprise. 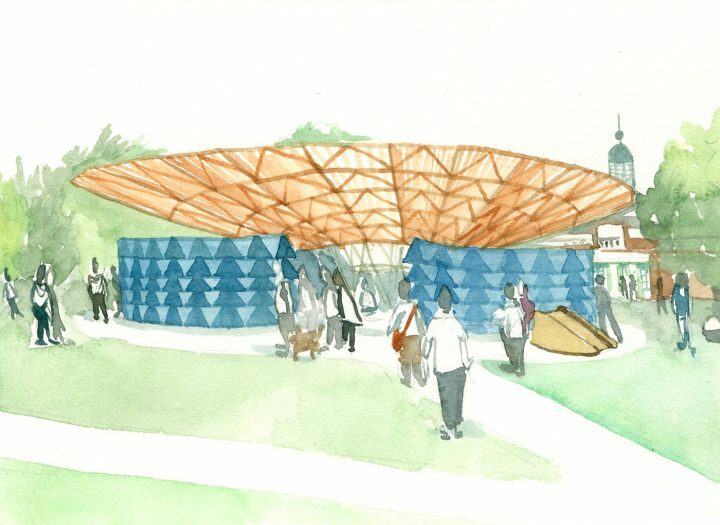 Set against the deep-shaded blue walls, in the middle of the pavilion, is a circular clearing, open to the sky, where rainwater is funneled to be recycled elsewhere in the park. In the opening are a few circular monolithic concrete stumps atop a bed of white gravel that reflects the light. Sitting here, I feel as though I have found a bright space within a dark cool blue cave. Children play with the little rocks around me. People naturally congregate in the opening, standing and chatting, enjoying the cross breeze, surveying the activity within the Pavilion. I could sit in this patch of light for hours. Eventually I move to the periphery of the space, where rows of benches or little wooden stools are arrayed. From here I can see out through the gaps in the walls, which frame the greenery of Kensington gardens, and strategically hidden from view are the main road and parked cars. For a moment, you forget you are in one of the largest, busiest cities in the world. The circular opening in the middle of the space becomes a focal point, like a stage and we, on the outside in the shade, are all spectators. The roof canopy is made of wooden slats in a system of interlocking rectangles, some of which are peeled upward to draw in light. The delicacy of the roof is supported by an equally fine cantilevered steel structure. 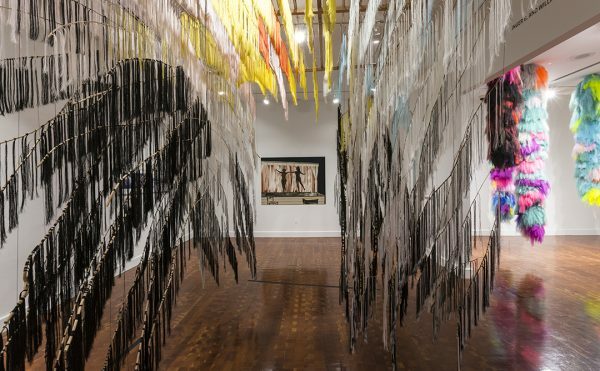 The steel trusses gently meet the ground in a series of points, as if the whole roof were a ballerina balancing on one foot with the other outstretched, making the impossible appear effortless. The blue-stained wood blocks are arranged to create a repeating “V” pattern, and between the V’s are small gaps. 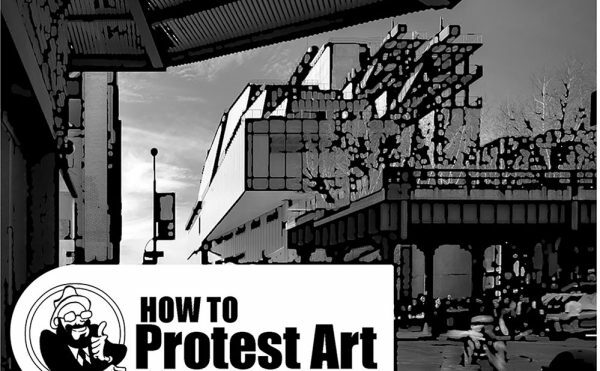 The wall performs like a screen that allows for the movement of air. There is a gap between the walls and the roof, also for cross ventilation, framing a view of the tops of the trees. From my seated position, I cannot see through the wall behind me, but across from me the gaps open up, and I catch glimpses of the park. Children take enjoyment in discovering this secret, and press their faces against the holes to spy outside. The Pavilion creates a sense of shelter by layering spaces: the curving walls are like the peeled-away leaves of an artichoke; in the middle is the heart. In the pavilion there is a coffee bar, but that is not the reason people choose to stay (although it is a welcome pick me up in the middle of the afternoon, after a long day of touristing). While I sit on one of the stools, sipping coffee and relaxing my feet, I note that people like to come and linger a while. The seating is arranged such that we all face each other. Not surprisingly many people are on their phones, perhaps killing time or waiting for a friend, but not everyone. An older gentleman is reading the paper; a father and son play on one of the stools; I notice a young architect explaining the design of the Pavilion to her group of friends; a woman and her boyfriend sit cozily chatting and people watching. While we may not know each other, we share this collective experience, however brief. In a time when our devices and fast-paced city living challenge face-to-face interaction, this year’s community-minded design delivers an important message. 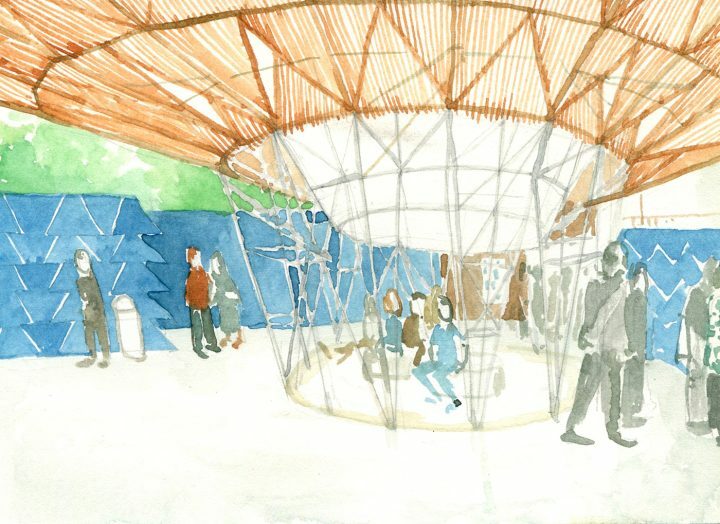 Kéré has brought us a successful design for public space that I would hope can be explored outside the privileged pocket of the Royal Parks, in other urban spaces in London and beyond. 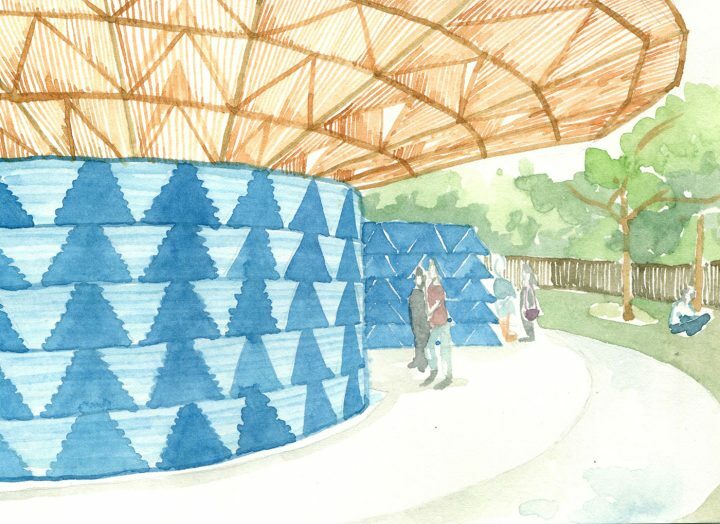 Serpentine Pavilion is open through November 19, 2017 in Kensington Gardens, London, England.